When children are in their preschool years, it is important to encourage them to play with their peers and learn social play skills. Preschool age children are able to learn these social skills as the ability to be social is an age appropriate in the preschool years. Researchers have discovered that social play becomes more prominent during the preschool years to include an increase in the frequency of social contacts, longer social episodes, and more varied social episodes. So what does this mean for you? It means it is time to schedule some play dates for your kids and the best place for the kids to play is in their cubby house! Sociodramatic play is the most advanced form of social and symbolic play. It is past the points of when children play together, but are doing separate things. Here, they interact off of each other’s pretend world. In sociodramatic play, children carry out imitation and drama and fantasy play together. They make believe and enjoy adventures in their pretend play world. Sociodramatic play involves role playing in which children imitate characters in real life or their favorite characters in books and television. They recreated things that have happened before to them in real life or things that happen on their favorite television shows. Then they add their own parts of the pretend play and their adventure will take them on to a whole new place. ~ Allow your child to have the time with friends away from structured activities. 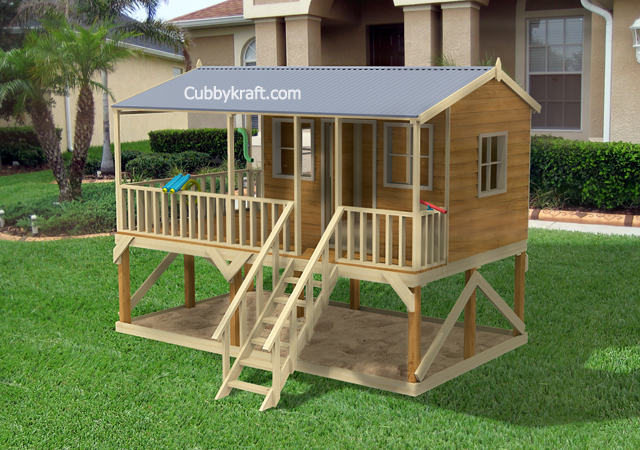 Remember that your child is safe in the cubby house in their own backyard and let them play. ~ Props are always a fun way to get a great game of pretend started. Dolls, dress up clothes, a pirate’s flag will all help your children play the pretend games they have created. ~ Listen to their fun times with interest. When you child wants to share how cool the universe is because they have just gotten back from Mars in their space ship cubby house, listen intently. Enjoy this memory! Here comes your child, ready for their mission to dance on the moon. They mount the stairs and ascend into their space ship. They turn and wave to you at the back door and then go off to play in space. While parents know that this cubby house and covered deck is a piece of kids playground equipment, it will never be that in the minds of your children. It is going to be a space ship, a princess’ castle or a gangster’s hideaway, depending on where your child wants to be that day. And it will change all of the time as out cubby houses inspire a creative imagination in children.